Last year was a pretty immense one for Doctor Who. It marked its fiftieth anniversary with the huge spectacle of "The Day of The Doctor", then had to say goodbye to Matt Smith, who left the series after three seasons. It was bittersweet because he was so great in the role and it was sad to see him go, but also because, as good as he was, it felt like he could have been even better if the show around him had been more audacious. Under head writer Steven Moffat, the show had lost the inconsistency that plagued its earlier years under Russell T. Davies, but it rarely hit the same heights that it reached when it was taking big, crazy risks that didn't always pay off. It didn't become boring, but it did lose its unpredictability, particularly as it tried to become more serialised in its storytelling, often at the expense of making good individual episodes of television. With a new Doctor comes a chance for renewal. New TARDIS, new face, new title sequence. While the first episode of the new season still has some of the flaws that has dragged the show down in the past, there are a lot of encouraging signs. First and foremost of which is the new Time Lord. Peter Capaldi, playing the show's first openly Scottish Doctor, is pretty much perfectly formed as soon as he saunters on screen. That's not necessarily that special at this point since the same could be said of Eccleston, Tennant and Smith, who all hit the ground running and never let up until they left the show in various states of exhaustion. However, Capaldi's instant rightness is important since he's so wildly different from his immediate predecessors. He's older, obviously, and has a crabbier disposition that hearkens back to William Hartnell's "imperious grandfather" take on the character, but with a manic, fervid quality that goes beyond the unchecked enthusiasm of Matt Smith, and (at least so far) little of the brooding darkness that so defined Christopher Eccleston and David Tennant. Doctor Who has lasted so long because it constantly changes while still remaining the same, much like the broom broom whose handle and bristles keep getting replaced. The key difference being that the new bristles have eyebrows you could take bottle tops off with. Capaldi also spends most of the episode being confused in a way that was not the case for the previous regeneration episodes; Tenant's regeneration left him unconscious for much of his introduction, while Smith was bewildered but driven by sheer nervous energy. Capaldi doesn't seem to know where he is, which serves to underline how stark a break he is from the man he is replacing. "Deep Breath" ends up feeling like an episode-length riff on his sudden transformation in "The Time of the Doctor". The show is demonstrably the same - with its playful, verging on childish tone, effects that walk the fine line between being impressive and cheesy, and the way that it prizes pacing and energy over structure and logic (qualities that also define other Moffat shows like Jekyll and Sherlock) - but the man at its centre is profoundly different in demeanour. There's certainly some of Capaldi's other iconic role, foul-mouthed spin doctor Malcolm Tucker in The Thick of It/In The Loop, in the scene where he gets used to his new face, and in the ones where the confronts old friends and new foes. Doctor Who seems determined to make as clean a break as possible, which is unfortunate given how messy the episode itself is. It brings in familiar faces like the Sontaran Strax, Vastra and Jenny Flint to make the transition a little easier, but it also brings in a T-Rex and drops it into Victorian London for no especially compelling reason other than how cool that image of it walking past the Houses of Parliament is. Moffat's script abandons the T-Rex pretty quickly by having it explode, thus serving as the impetus for a murder investigation that involves robots harvesting peoples' organs to disguise themselves, and to facilitate their desire to leave Earth to reach a semi-mystical Paradise. That's a pretty fun premise and, dinosaur aside, makes for a relatively small-scale start for the new phase of the show (long-time readers of these recaps will know that my main gripe with the Moffat era is the tendency to make every episode about saving the world/universe) but it also seemed to sideline the whole regeneration business. The episode seemingly kept forgetting that a major event had happened for long stretches of time, then would suddenly slow down to discuss the change at length. It made for an awkward introduction to the new Doctor, and while there is probably no happy medium between the need to introduce the new actor and to tell a captivating story, "The Eleventh Hour" demonstrated beautifully that you can make that messiness work wonders with the right actor (which, I would argue, the show has) and the right story (which, I would argue, the show doesn't). When the show did engage with the question of what the Doctor changing would mean for his relationship with Clara, the episode improved drastically, especially since Moffat made their lack of trust in each other central to his story. The spikiness between Capaldi and Jenna Coleman came to a head in a great scene at a restaurant, which then segued effortlessly into a trap, an escape, a rescue and a solid Doctor monologue. The mix of odd couple humour and outright antagonism between the two suggests that there is potential there for the show to explore a Doctor-Companion dynamic that its current iteration has yet to explore. Whether it takes that route, or if it will just have Clara moon over a different Doctor, remains to be seen. Still, entertaining the idea of trying something new is encouraging considering how badly the show has got stuck in the same (admittedly entertaining) patterns over the last few years. Another encouraging sign: the show finally seems to be engaging with Clara as a real person, rather than as an concept. When it first introduced her a few years ago, Doctor Who made Clara out to be a puzzle to be solved rather than a character with much of a personality, and while she still feels a little too much like Amy Pond without a boyfriend to weigh things down, she at least is starting to show some consistency and spirit that wasn't there before. Jenna Coleman has always been tremendous fun on the show, and making her smart and resilient, while also giving her something resembling responsibility for her own fate (even if it took the form of having her hold her breath to remain undetected by her mechanical captors) is a step in the right direction. The performance has always been there, but the writing has been lacking. This felt like the first episode where she transcended the problem of being merely a collection of well-performed tics to become a genuine character. Finally, the episode felt like a standalone story, rather than like a tiny piece of a puzzle that might or might not come together at some point in the future. 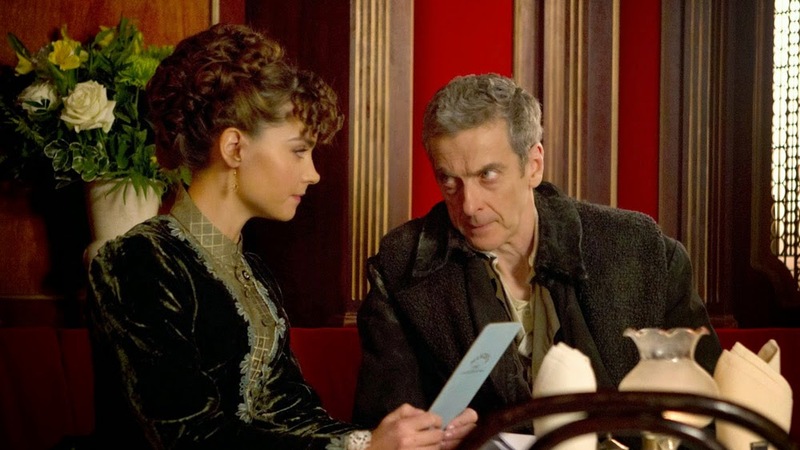 There was still a touch of mystery involved since the episode left it unclear why Clara and The Doctor were tricked into going to that restaurant, and it certainly seems as if the mysterious Missy (played by Michelle Gomez) will play a bigger part in the episodes to come, but it wasn't bashing us over the head with a lot of Big Picture talk. There's still time for the show to mess that up and try to tell stories that its writers aren't up to realising, but it's a new start, so let's be a little hopeful, eh? After all, The Doctor represents hope and optimism at his best, and there's always a chance for redemption, even for a 2,000 year old mass murderer and the show around him. I feel like I have to rate this episode on two scales: As both an episode of Doctor Who and as an introduction to a new version of the character. As an episode of television, it was pretty uninspiring. The villains were creepy, both in their physical appearance and their vaguely religious fervour for killing people for spare parts, but it felt very familiar. As with the use of popular recurring characters, that familiarity might be part of a way of easing audiences into a new era of the show, but that doesn't wholly excuse its workmanlike quality. Yet it did give Capaldi plenty of opportunity to demonstrate what he will bring to the role and how his performance is tonally different to Matt Smith's, while still feeling like The Doctor and allowing the show to make lots of sly references to its own history around the main action. It didn't have the exhilarating high of Matt Smith's introduction in "The Eleventh Hour", but it also wasn't as bloated and shapeless as David Tennant's in "The Christmas Invasion". "Deep Breath" is neither a triumph nor an embarrassment. It's just business as usual for Doctor Who, which ultimately may be the best way forward for the show; to stop making such a big deal of everything, and just tell stories. - This episode was directed by Ben Wheatley, the very prolific British film director behind the ultra low-budget crime films Down Terrace and Kill List, the excellent dark comedy Sightseers, and the forthcoming J.G. Ballard adaptation High-Rise. I like Wheatley a great deal as a director, and friends of mine who have worked with him say that he is a pretty lovely guy, but I didn't feel that he brought much to the episode apart from a suitable grubbiness to the scenes set in the streets of London. The show occasionally makes the past a little too clean, so an episode that recognises that dirt isn't a modern invention is a welcome change. - OH MY GOD MATT SMITH CAME BACK! Well, briefly. I'd managed to avoid any of the plot details that leaked out in the weeks before the episode aired, so I had no idea that he had filmed a goodbye telephone call to Clara. That made for a really quite lovely little surprise. I got a little bit misty-eyed, I have to admit. - Moffat's turn as show runner has dialed down some of the broad comedy that defined Russell T. Davies' tenure, instead focusing on rapid-fire dialogue and playful banter. That made the scene where Strax seemingly knocked Clara out by throwing a copy of the Times at her head feel really odd and out of place, and further underlined how unfocused the episode as a whole felt. - "I hate being wrong in public. Pretend that didn't happen."